In this Diablo 3 Wizard Leveling Guide, I will be providing an overview of the wizard class, followed by more detailed chapters of the leveling guide which cover more specific wizard skills and tips for fast leveling. Wizards have long been know for their ability to cause massive amounts of magical damage while being a bit weaker in the armor department. The Diablo 3 wizard falls right in line with these notions…but with a few twists. In Diablo 3, the wizard is a frightfully powerful master of fire, ice, arcane powers, as well as time itself. As the story goes, wizards are the free-spirited outcasts of the magic-using world. With mages and sorcerers being fairly adherent to the rules of safety and self-control, wizards opt for the path of reckless immersion in their awesome powers. While classically trained as casters, wizards represent the rebellious and powerful elite, adhering to no rules but their own. Like the other classes in Diablo 3, the players will have the choice of leveling with a male or female wizard, with custom animations and character styling to match. In almost every RPG that I have played, the wizard class (whether it be a mage, sorcerer, warlock, etc) has always proven to be highly skilled at dishing out enormous amounts of damage with more than a few tricks up their sleeve. The Diablo 3 wizard class is no exception. When able to step back to a safe distance, this character class is able to channel their arcane energies and launch a devastating flurry of magical attacks that will lay waste to your enemies in quick fashion. Masters of the elements, wizards are expert conjurers of AOE, or area of effect attacks. They are able to cause widespread damage to large amounts of foes at once, all from a relatively safe distance. In the event that wizards find themselves in the path of danger, they can cast protective spells such as Teleport and Slow Time to avoid the incoming damage. Arcane Power is the new resource for the Wizard class. Arcane Power is said to be absorbed by the wizard from the energies in the world around him or her. Unlike mana, Arcane Power regenerates very quickly with almost always enough “gas in the tank” left to cast at least a small spell. However, because of the great potency of Arcane Power, it does take a toll on the wizard’s body and can lead to exhaustion if abused by casting too many large, powerful spells in a row. For this reason, many of the wizard’s more devastating abilities are on a fairly long cooldown timer. Not to worry though, the wizard class has many smaller spells to cast in between cooldowns. Such a quickly regenerating resource will certainly help make the wizard class adept at fast leveling in Diablo 3. Wizards will be able to use a surprisingly wide range of weapons in Diablo 3. They will have access to the traditional wizard weaponry such as staves, wands, one-handed swords, off-hand orbs and magical daggers. However, as it stands in the current version of the beta, it appears that wizards will also be able to use a variety of less-common wizard weapons such as spears, two-handed axes, and bows. 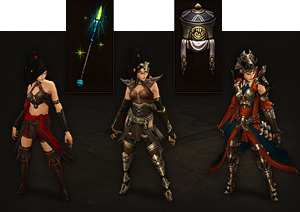 For armor, Diablo 3 wizards will start off with access cloth armor but will quickly develop the ability to wear more protective vestments such as hardened leather chestpieces. At the higher levels, the wizard class will have access to highly-ornamental and protective gear such as powerful headpieces and inlaid metal plating to accent their mighty robes and tunics.